The UN force chief in the Democratic Republic of Congo has complained there is still no sign of 3,000 peacekeepers approved by the UN five months ago. Alan Doss told the BBC his force was overstretched and unable to respond effectively to outbreaks of violence. He said he needed the extra troops to deploy against a Rwandan Hutu militia and the Ugandan Lord's Resistance Army. Meanwhile, the UN said fighting by other rival militias in Ituri province had displaced 30,000 people. 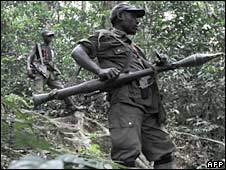 Eastern DR Congo saw intense fighting between Congolese rebels and government forces late last year. The 17,000-strong UN mission, known as Monuc, was placed under strain during the major offensive in North Kivu province, which forced 100,000 civilians to flee. In November, the UN security Council authorised the deployment of an extra 3,000 troops to the region. Mr Doss said there had been an improvement in the situation in the east of the country following a five-week joint military operation launched in January between the forces of Rwanda and DR Congo. The campaign led to the arrest of the leader of the rebel National Congress for the Defence of the People (CNDP), and the surrender of many fighters. They said they were fighting to protect the Tutsi community from attacks by Rwandan Hutu rebels based in DR Congo. "The less good news is that operations are still ongoing and will have to continue for some time against the ex-genocidal forces, the so-called FDLR, the ex-Interahamwe. That's a big job," he said. The FDLR's (Democratic Forces for the Liberation of Rwanda) presence in DR Congo lies behind years of unrest in the region and some of its leaders are linked to the 1994 Rwandan genocide. Mr Doss said he wanted to send the extra troops to restive Ituri province and to South Kivu, where FDLR fighters have been operating. The Welshman said he also needed to send additional forces to Haut-Uele province, where Ugandan rebels were "doing terrible things". The LRA has killed hundreds of civilians in the north-east of DR Congo since going on the rampage in the region last Christmas. "We are stretched and the additional 3,000 will also enable us to create a force reserve so that when a situation erupts as it did last September and October, we had no reserves," Mr Doss said. "It is true that we have a mandate to protect but within the limits that we know, we can't be everywhere all of the time and this is a serious concern for us," he added. 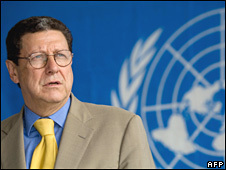 UN officials have often said their peacekeepers are thinly stretched over a country the size of western Europe. In the north-east of DR Congo, the UN's refugee agency said fighting between the Popular Front for Justice in the Congo and the Revolutionary Front for Peace in Ituri had displaced thousands of people. It said they had no food or shelter. Many had only recently returned to their homes, after fleeing earlier attacks.